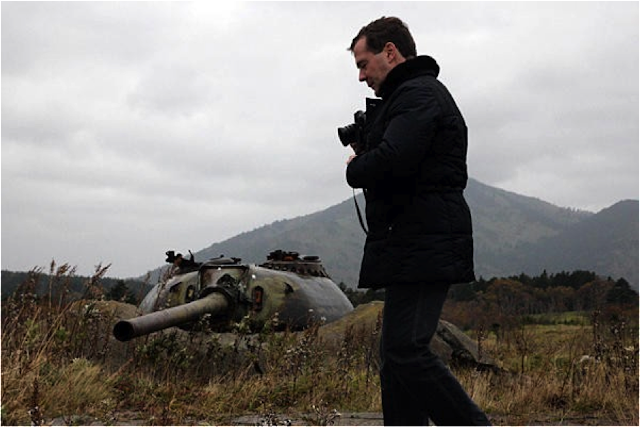 Current Russian PM Dmitry Medvedev (then President) visiting the Kuril Islands in 2010. He has repeated his visit just last week, to the ire of Japan. From International Business Week. Lying to the North of Japan but to the East of Russia, four tiny Islands have represented the source of continued tension between these two states since the end of World War II. 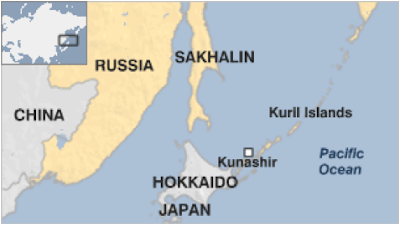 The Islands, known as the Kurils in Russia and the Northern Territories in Japan, have in fact influenced relations between these two states to the extent that they have yet to sign a formal treaty settling World War II. In total the Kurils comprise of 18 islands, but only the four Southernmost are disputed.The dispute itself represents an interesting case for international lawyers who often seek to dissect the various agreements, including those signed at Yalta and Potsdam, which have resulted in this inconclusive state of territorial affairs. But this case also represents a valuable compass for anyone seeking to understand how cultural considerations can overwhelmingly affect how such disputes are played out over the years and whether or not they can be easily resolved. Russia, in recent years has sought to strengthen both its presence and its claim to the Islands. Dmitry Medvedev visited them personally in 2010 and again a few weeks ago, drawing an irate response from Japanese officials and a further chilling of relations. Furthermore, Russia has sought to strengthen its military presence on this Eastern frontier and such is its commitment that it has even formed a Ministry for the Far East, with the aim of not only strengthening its presence but also seeking to achieve development and business objectives through exploitation of the vast natural resources in these regions. This is no divergence from Russia’s recent and current policy of strengthening its presence at its frontiers and seeking a strong position amongst its immediate neighbours, of which Japan is one. In fact this has manifested itself in the East with the resumption of aircraft and maritime patrols in the far-East, a practise dating back to World War II. Of the 18 Kuril Islands, 4 are claimed by both Japan and Russia in a dispute dating back to the end of World War II. From the BBC. For the Japanese, economic considerations also abound. The natural resources present are obviously a massive attraction, particularly as Japan does not possess a particularly large amount of these and has tended to rely on its neighbours and allies, including Russia, for energy, or, has promoted nuclear technology which since last year’s tsunami disaster, has come under close scrutiny and criticism. On paper it seems that there is little which these two old foes might agree on in the near future to resolve the situation, and in many ways this assumption could be deemed correct. However, it fails to take into account some of the more culturally ingrained reasons for the continuation of this dispute, which, if addressed, might represent a pathway to some sort of resolution. Both countries in many ways cling to their attachment as a result of historical factors and considerations which continue to be perpetuated in cultural terms. An agreement reached in the late 1800s meant concensus existed, but it was shattered by the Japanese defeat of Imperial Russia in the Russo-Japanese war of 1905. Skip forward 40 years and this time Communist Russia was the victor and Imperial Japan was the defeated, humiliated adversary. These historical events may have been a lifetime or two ago but they continue to manifest themselves in current popular culture in both states. Countless studies have sought to dissect the Japanese reaction to the loss of World War II and subsequent attitudes to its own history. An oft cited example is the continued adoration across sections of Japanese society of Judge Pal, the only Allied justice who handed down a not guilty verdict for Japan’s wartime leaders. In fact even former Japanese Prime Minister Shinzo Abe openly praised Pal during a state visit to India (Pal’s homeland) in 2007. While generalisations should and must be avoided, this example does represent a valuable example of how historical events and their cultural perpetuation have in some ways impacted Japanese attitudes regarding World War II. Essentially, as some have suggested, the perpetuation of certain historical or cultural ideas results in reducing ‘the area for maneuver in decision making, which explains the commitment of the Japanese to one course’ in regards to the Kurils. Meanwhile, the Russian point of view tends to highlight the belief that Russia is entitled to the islands as a result of its victory in World War II and the massive sacrifices it had to make, particularly in the form of human lives. So in many ways this dispute is about a lot more than just the abundance resources. In fact, while both countries seek to achieve economic and foreign policy objectives, their desire to achieve these without compromise is perpetuated by historical and cultural factors. This does suggest that a resolution could emerge if the underlying factors were dealt with first. There is evidence to suggest that a cultural ‘understanding’ between the two, or more broadly the achievement of some sort of common ground on a cultural or even humanitarian ground could help foster better relations. Several commentators have noted that relations between Russia and Japan reached a high level in the aftermath of the 2011 tsunami in Japan and its nuclear catastrophe aftermath. Obviously, the road to resolving the territorial issue itself would be longer, but when taking into consideration that essentially both seek economic goals, agreement may not be that difficult to reach. There are precedents of co-operation of this type between the two in Siberia, something which only further advances the theory that the cultural element of the dispute is working towards sabotaging any form of agreement. Exterior solidarity, internal rivalry. Sino-Russian relations aren’t as healthy as many in the West like to portray. NY Times (Pool photo by Mark Ralston). Observers were quick to point to Putin’s recent state visit to the People’s Republic of China as being indicative of a new strengthening of relations that should be of concern to the West. Burgeoning trade figures aside (China has now become Russia’s largest trading partner and the two nations hope to more than double bilateral trade by 2020), attention has gravitated towards their increasing military ties. Only recently the two nations participated in shared naval exercises in the Yellow Sea, which solidified a decades-old commercial relationship fomented by Russia’s massive arms industry. Russia and China, along with most Central Asian states, have been developing strong military and anti-terror links in the past decade through the Shanghai Cooperation Organization, which is seen by many in the West as being a counterbalance to NATO in the region. Given recent developments, Western nations’ concern isn’t entirely unfounded. Military cooperation has corresponded with similar diplomatic cooperation. The destruction unfolding in Syria is just as tragic in its substance as it is tragic that the limp inaction by the UN Security Council serves only to prolong it. For the West, the latter is the brazen Realpolitik of Putin, defending Russia’s arms sales to Assad whilst at the same time looking to snub the interventionist approach previously taken to oust Gaddafi. The idea of a joint Sino-Russian behemoth has aroused Western anxieties for a long time; now that their links are solidifying, these sceptics have found that their predictions are becoming self-fulfilling. But is this necessarily a correct view? Prying open their exterior stance to the world, one may find that the relationship is far less cosy. Putin’s aforementioned visit to China was much less significant than many- whether Russian, British or otherwise- like to portray; Putin visited both France and Germany before heading east. Medvedev, often assumed to represent the Kremlin’s friendlier face vis à vis the West, displayed little change in continuity as far as foreign visits are concerned. Both Presidents’ first official visits were to Kazakhstan (Medvedev) and Belarus (Putin) - countries which would form part of the proposed Eurasian Union. Clearly, Russia prioritises these states; so much so, that it was seen as the real reason why Putin didn't attend the recent G8 summit. 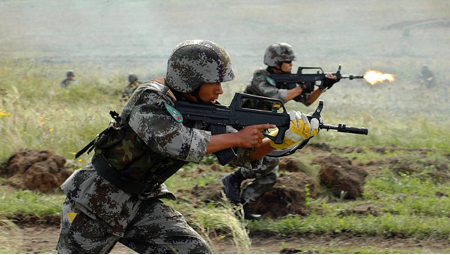 Soldiers of Shanghai Cooperation Organization member states performing an anti-terror drill in Kazakhstan, 2010. RIA Novosti. Unfortunately for Russia, China may not be so content to let another nation vie for influence in this resource-rich region. It may have played a less active role abroad in previous decades, but China is playing catch-up and exerting its influence across the globe- crucially in Central Asia - through soft power and generous loans. Countries like Turkmenistan, shunned by the West for their questionable political freedoms, find China's help a lot less politically questioning. 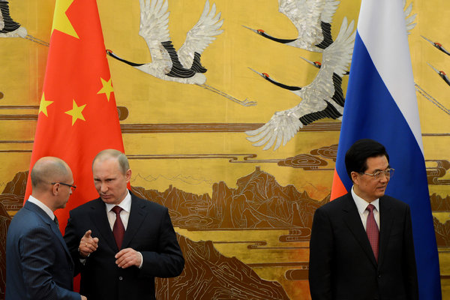 Russia's relationship with China, too, is economic. Bilateral trade is booming, but it is still ultimately a trade of commodities. Resource-rich Russia is a supplier of, and China a consumer of energy. Consequently, energy pricing is something which has already been biccered about between the formalities and festivities. Decades-long Russian negligence of the Far East has allowed Chinese influence to penetrate. Chinese migrant labour is felt acutely in this scarcely-populated region, and clashes have already broken out between locals and Chinese. With a population of less than 7 million, the Russian Far East is acutely vulnerable to large influxes of migrant labourers. Moves to rejuvenate the region by Russia can be mutually beneficial. Infrastructural projects in Vladivostok, such as the world's longest cable-stayed bridge, form part of a wider effort to ready the region for the Asia-Pacific Economic Cooperation forum in September. A Pacific-orientated Russia can be of benefit to China. But a conscious decision to strive to be both a Eurasian and a Pacific power has implications that place it in conflict with China's own emerging ambitions. As it stands, Russia and China aren't equal partners- much like the UK and the US aren't. A renewed Russian assertiveness in the Far East and Central Asia may rile those who see Beijing- and not far-off Moscow- as being the real dominant force in the region. The realisation of the Eurasian Union by as early as 2015 (this being Putin's target) might be in response to greater fears of Chinese encroachment in Central Asia. By establishing it in the next few years, Moscow can anchor itself in the region for the forseeable future without having to out-bid Beijing for political power- which is increasingly unaffordable. This isn't the only time that relations have had strains beneath the surface. Whenever significant shifts in policy have been undertaken by one nation, relations tend to sour. From Stalin's death in 1953, when ideological parity between the two communist powers was broken, to the break-up of the USSR, abrupt changes have resulted in a cooling of relations. Many forget that the two powers engaged in a seven-month military conflict over borders in 1969. The West has occasionally tried to take advantage of these periods, most notably during the 1970s, when Richard Nixon visited an ageing Mao in an attempt to politically isolate the USSR. Britain and other nations that find concern in the flourishing Sino-Russian relationship only need to look at recent history to realise that consistency is certainly not a feature of the relationship. Putin's new tenure in office would appear to signal consistency, but a renewed brazenness by the Kremlin will only be tolerated by Beijing whilst it serves its interests, and certainly not if it comes into conflict with them. On the international stage solidarity between them is useful, but closer to home tensions do exist, even if they are well-concealed. It would do Britain and other Western nations good to keep a watchful eye on events in Central Asia- influence there is a prize which neither Russia nor China will be prepared to share.